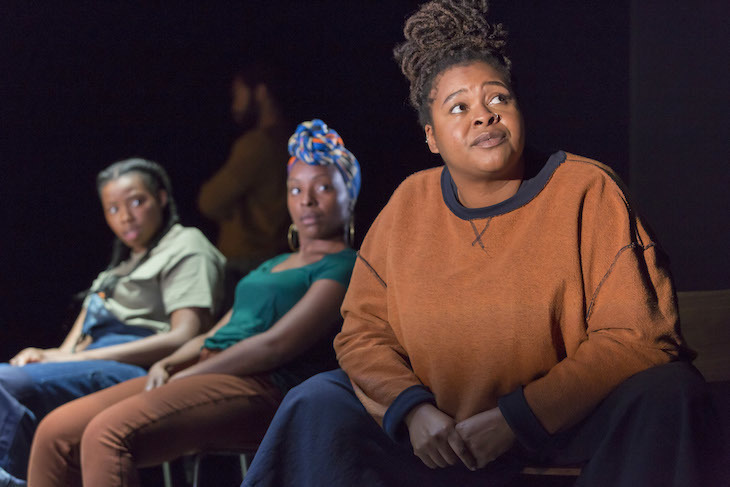 debbie tucker green has turned her gaze on the experience of black British and African American people in a shocking, furious, occasionally hilarious but always poetic kaleidoscope of a play. 14 people stand on stage, configuring in pairs or groups. A mother counsels her son on how to maintain his posture so as not to be interpreted by white people as seeming aggressive/guilty/provocative etc. An older mentor dissuades an enraged man from kicking back, a woman/man describes a ‘stop and search’ experience. The dialogue switches from fragment to fragment, sometimes with the same scene recurring but with different characters from either the UK or USA reciting identical dialogue. It’s a conceit that works and is a dense and hypnotic onslaught that leaves you dazed but hanging off every word. 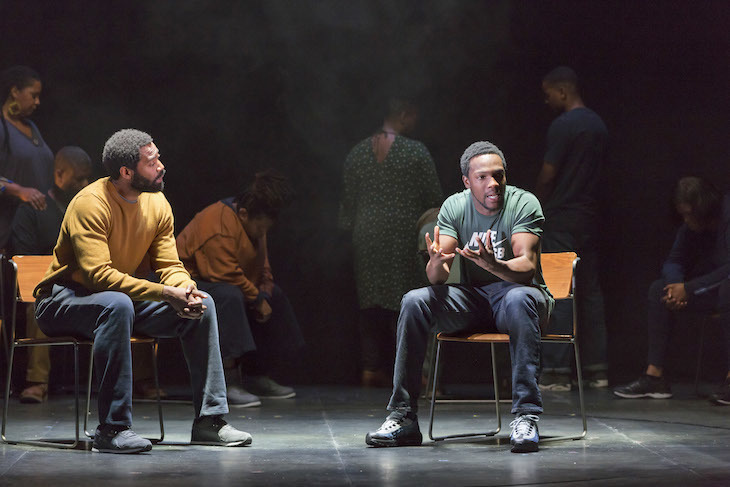 The play switches focus for a shorter second part where an older white male academic relentlessly patronises a younger black female student and tells her his definitive interpretation of events as they discuss an incident where white boys perpetrated a massacre against a group of black students. Finally, there’s an uncomfortable filmed section where white British/American people recite bygone laws of punishment and segregation. 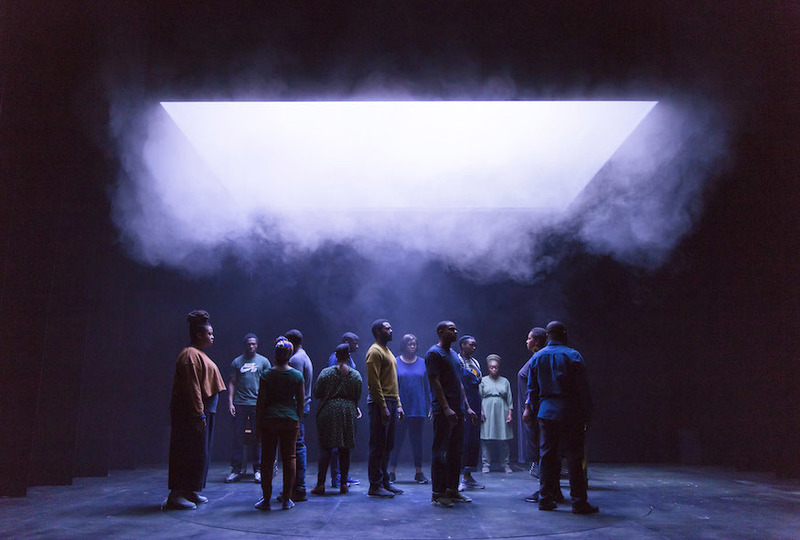 tucker green is on form with this painful and illuminating play that prods and provokes. At two and a quarter hours with no interval it occasionally feels like an endurance test but is never dull thanks to the quality of writing and the tonal shifts. ear for eye, The Royal Court Theatre, Sloane Square, SW1W 8AS. £12-49, until 24 November 2018.